Those looking for a thoughtful debate on technology found they tuned into the wrong channel. The Congressional hearing was more of an SNL skit about political posturing. The match between the well-prepped Google CEO, Sundar Pichai, and the well-scripted House Judiciary Committee felt like you were watching two tennis aces practicing high lobs. The anticlimactic ending was predictable: our political leaders cannot be trusted to rise above vitriolic politics, the company’s chief executive is more concerned about the revolt of his employees than he is about Russian trolls, and Congress has no idea how what Google does. The Committee members did learn the word ‘algorithm’ however, and you can be sure staff members are busy writing a briefing paper this morning. In other words, business as usual, on Capitol Hill. Pichai neglected to add that Google’s engineers, the same group of employees who were being accused of political bias, write the algorithms. There were pertinent questions, as well, ranging from the charge of liberal bias, the frequency of Russian trolling, Chinese search engines, and the sanctity of privacy concerns. Pichai ducked them all. He drew on an old formula by repeating that there are only three things that matter in technology. They are, in Pichai’s version of the epigram, algorithms, algorithms, and algorithms. Pichai wasn’t debating the Committee, after all, they would have to understand technology to have a debate. He was merely telling them the truth, as in a garage mechanic telling you your engine is oscillating abnormally because of a fuel injection surge. According to Pichai, if we leave well enough alone, algorithms make everything right eventually. 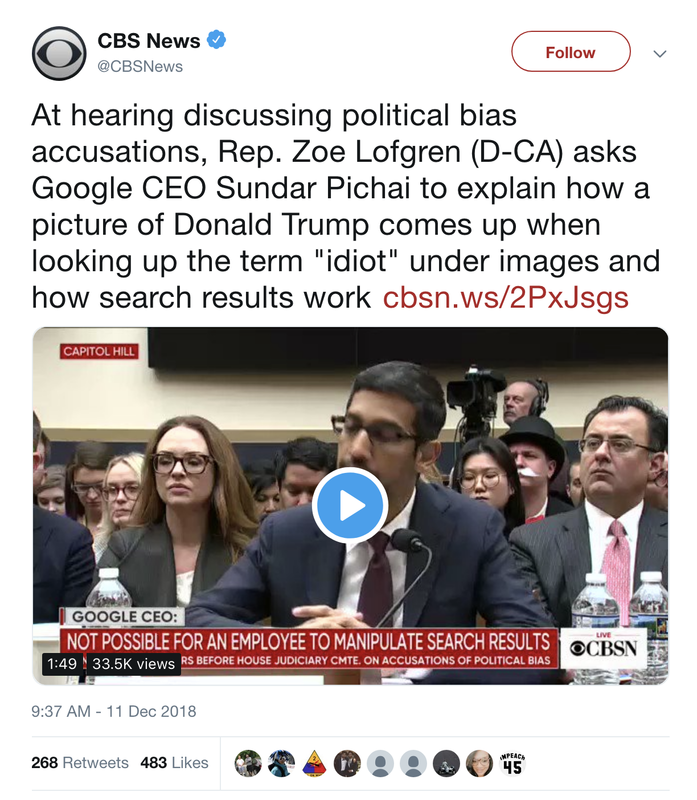 When Rep. Zoe Lofgren (D-Calif.), who hails from Silicon Valley, asked Pichai to explain why a search for “idiot” results in a picture of President Trump? Pichai responded that the algorithm works in mysterious ways, but it wasn’t biased, because “we don’t manually intervene on any particular search result.” He neglected to add that Google’s engineers, the same group of employees who were being accused of political bias, write the algorithms. “Trust me,” Pichai seemed to be saying. In the recent election, the Russians spent $4700 in advertising. Compare that to Google’s $30 billion first-quarter revenue. The hearing took on the aspect of a show trial as Republican Congressmen pushed hard on Google’s political bias and Democrats worked the Russian troll angle. The two are somewhat remotely connected. Because social media dictates our views (to be fair, Google is not a social network since folding Google+), the Russians were merely following the money. But according to Pichai, they didn’t put much oomph into their effort. In the recent election, the Russians spent $4700 in advertising. Compare that to Google’s $30 billion first-quarter revenue. Claiming the Russians used Google to influence the election would be like asking GM if a screw on the floor in an Ohio factory was responsible for hacking GM safety across the whole company. On the subject of a Chinese search engine — one that could reveal personal information to the Chinese government as well as to redact data considered inappropriate — Pichai was adamant they had no such product. But when Rep. David Cicilline (D-R.I.) asked if he would ever “launch a tool for surveillance and censorship in China,” Pichai responded that he would be “very thoughtful” and “will engage widely as we make progress.” Everyone tuning into the House hearing got the memo: Pichai never ruled out a Chinese product that censored information. The hearing demonstrated the pitchforks are out but unsharpened. There were a host of embarrassing matters the Congressional inquiry could have brought up, including Pichai’s eye-popping $200 million paycheck. That will likely happen in 2020 if the company does not take significant steps to fix the perception of political bias. Google is now a collective of talent workers not a company of shareholders, and they, not management, decide the future of the company. Google does have a real problem, and while it stayed under the surface, it is the one that should worry all chief executives. As business models adapt 5G and AI into the workplace, most companies will hire the same employee demographics as Google’s, young, smart, agile, and highly democratized. They think of themselves not as workers, but more like law partners who have a say in governance, strategy, and compensation. When they don’t get their way, they flog the CEO on social media and protest outside the headquarters. Management has become a caretaker discipline and no longer has the discretion to independently allocate capital. THAT is huge or yuge, if you prefer. In that sense, the House hearing was a failure because it did not address the critical issues like Google employee’s refusal to work with the Department of Defense on drone technology or the “women’s walk” in which 20,000 Googlers left their offices to protest the company’s policies around sexual misconduct. That none of the female members of the Judiciary Committee brought this up was a pretty clear indication this wasn’t meant to be serious, just a performance for the folks at home. What those questions would have revealed is that in the Google world, matters like sexual misconduct policy and business deals are subject to a vote by a democratic horde of employees. Google is now a collective of talent workers not a company of shareholders, and they, not management, decide the future of the company. On the day of his hearing, that is what Sundar Pichai was worried about, not Russia or China or the sanctity of your location as you walk into Nordstrom’s. When Pichai returns to Mountain View in Silicon Valley, those thinking he’s glad to be away from Congress and back home will be wrong. He just had the friendliest and most appreciative audience he is going to get for a while.